TORONTO, ON – A new brewery founded by and for dog lovers is opening this weekend in the east end of Toronto. Black Lab Brewing has been established by a team that includes spouses Billy and Anne Madden and brewer Connor Deuchars, with the Maddens’ black lab Snoopy serving as the brewery’s mascot. The dog-friendly 3600-square-foot venue features a brewhouse, tasting room, and retail shop, as well as a private event room on the second floor with space for up to 20 people. Beers available on tap and in bottles at opening will include Sitting Pretty Rye APA, Double Dry Hopped IPA, and Rhubarb Kennel Sour, with more to follow in coming weeks. 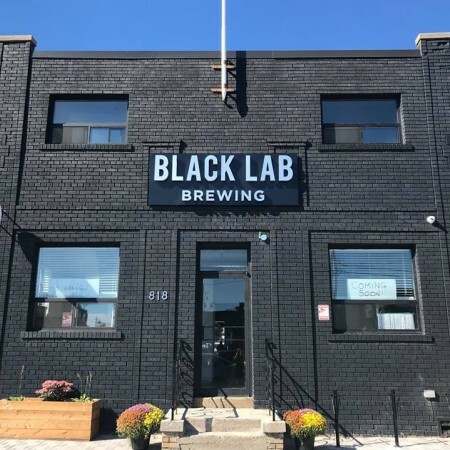 Black Lab Brewing is located at 818 Eastern Avenue in Toronto, and will officially open tomorrow (October 13th), with business hours of 11:00 AM to 9:00 PM daily except for Mondays. For more details, see the Black Lab Brewing Facebook page and Instagram feed.